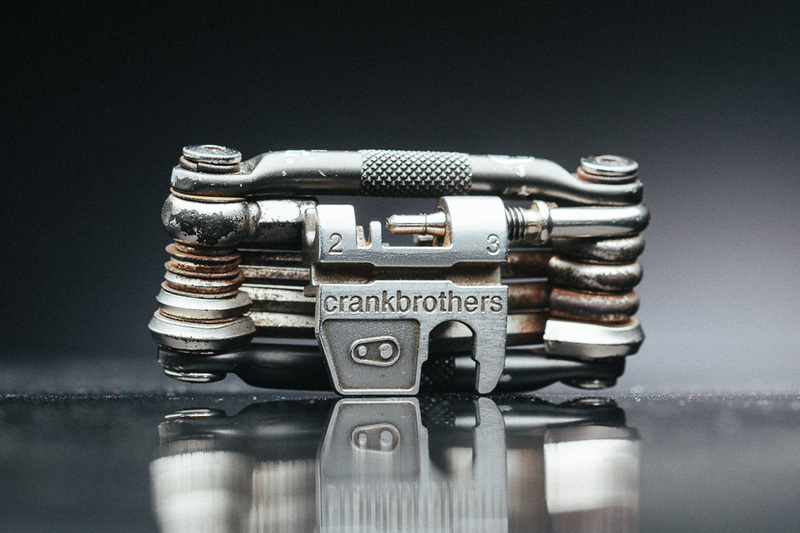 It feels kind of odd to write about my trusty Crankbrothers m17 multi tool. When something has been by your side for more than five years, on hundreds of rides, in dozens of countries, it’s easy to take it for granted. It’s kind of like loved ones or close friends: They’re always there and usually reliable. So it’s not uncommon to overlook how important they are in the broader scheme of things. The same could be said of my Crankbrothers m17 multi tool. It’s been all over the world with me. And it’s a regular companion on everyday rides. Yet it rarely elicits praise or even affirmation. It simply rests in a bib-short pocket or the waist strap of my riding pack, waiting for the moment it is called to duty; waiting for the countless times it has been called upon to perform a multitude of perfunctory tasks, all with the same predictable precision. It has sat in its lonely and austere confines, subjected to extremes of heat and cold—and the constant corrosive elements of my own sweat—and has suffered each moment with the stoicism of a Spartan warrior. My m17 might look a bit rough around the edges these days, but it still does its duties as well as the day I first pulled it from its shiny packaging. It comes with a lifetime warranty, but something tells me I won’t be needing it. 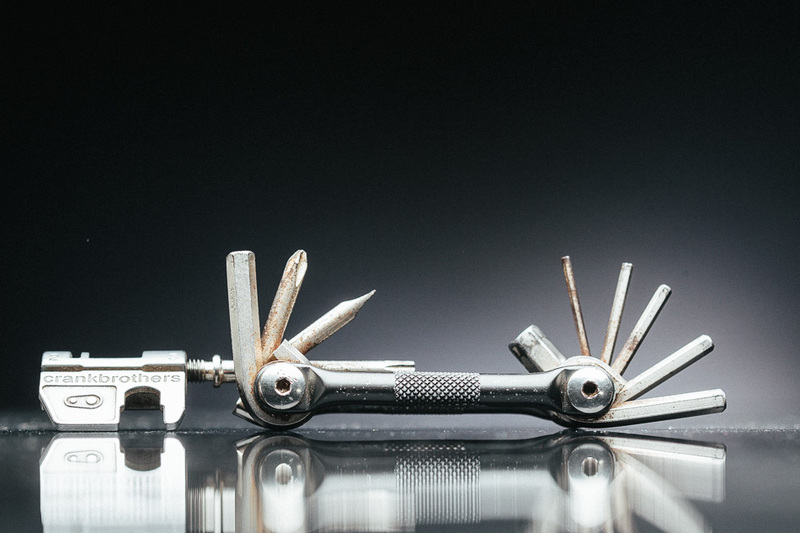 In recognition of the m17’s unflinching utility, I’ve given short shrift to many other multi tools (including higher-priced offerings from Crankbrothers). Some tools have made it through one or two test rides, often to be set aside due to their overly lofty aspirations or impractical pretensions toward diversification. And once again, I find myself reaching for my trusty m17, confident that it will rise to the occasion with an abject paucity of fuss. So behold these images of my faithful riding companion, with its steel Allen-bit arms rusting from repeated exposure to the sweat of my lower back. To me, this rust is tantamount to the wrinkles of an old friend’s face, weathered by laughs and exposure—the evidence of a life well-lived. The m17 combines an aluminum frame that gives superb grip with 17 of the most essential tools a mountain biker will ever need. It features 2-, 2.5-, 3-, 4-, 5-, 6- and 8-millimeter hex wrenches, Philips and flathead screwdrivers and a Torx T25. The cast chain tool has always been a standout feature of the m17, offering ample grip and a stable platform for pushing chain pins through with precision and an economy of fuss. The chain tool also features cast-in spoke wrenches (#1 through #4) and 8- and 10-millimeter open wrenches. It’s a lot of proven utility with minimal weight. The entire tool weighs just 168 grams. 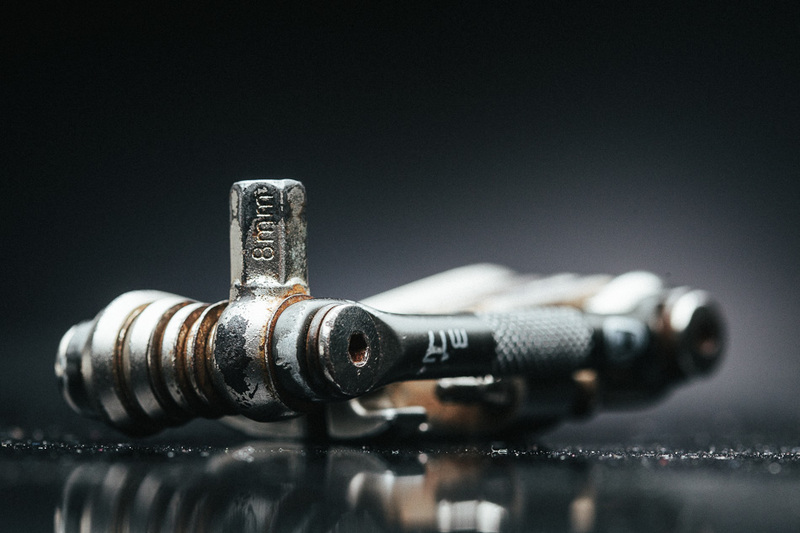 My one-and-only complaint about my m17 is the fact that this early version of the tool sports an 8-millimeter hex wrench that is too short for some applications—such as putting pedals into certain crank arms. For riders who frequently run flats or the likes of Shimano XTR pedals, the 8-millimeter hex wrench is one of the most commonly used tools. Fortunately, Crankbrothers has lengthened the m17’s 8-mil hex wrench, so buyers of the updated tool should be happy with this functionality. I would get an updated version if I wasn’t already so attached to my steely riding companion. 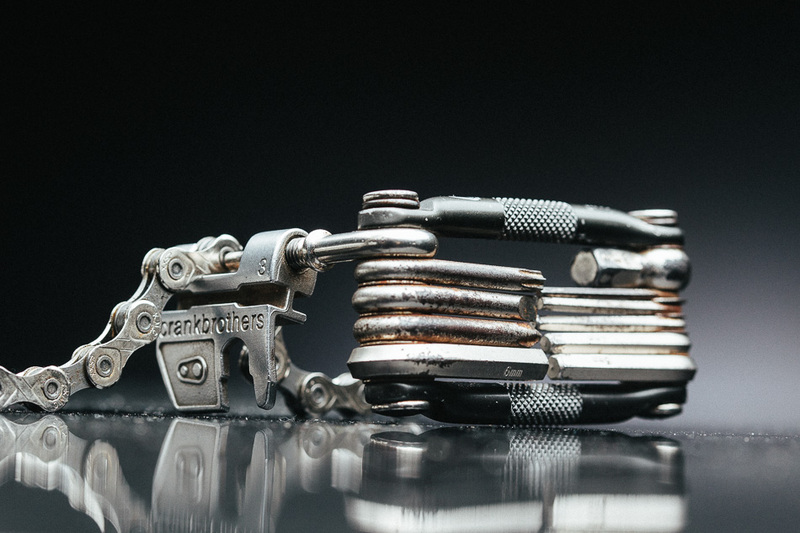 Of all the Crankbrothers products I’ve used over the past decade or so, the m17 multi-tool is my hands-down favorite. It’s one of those rare products that truly mates aesthetic form with pure function. And the updated version of the m17 retails for only $28, while the incarnation pictured here can still be found online for as little as $20. 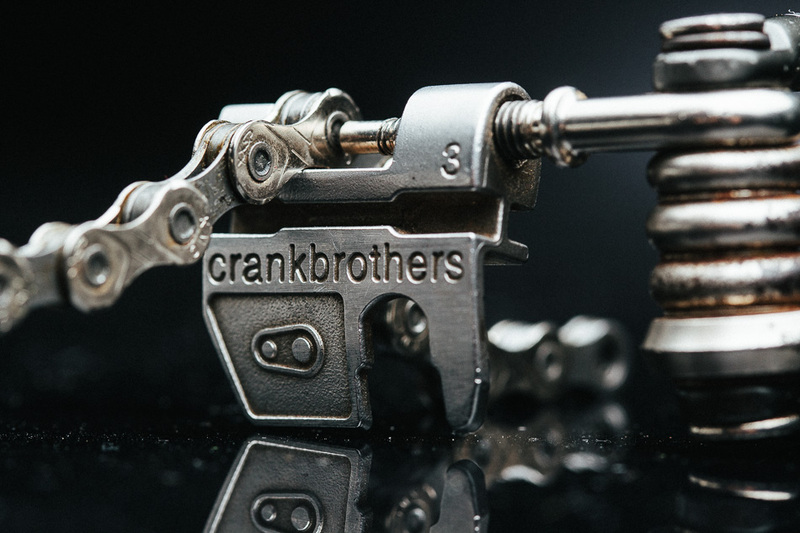 There are a lot of ingenious, innovative and highly functional multi tools on the market, but for my $28 I’d be hard-pressed to find a more versatile all-rounder than the Crankbrothers m17. And even though I could upgrade to a newer version with a longer 8-mil hex wrench, I probably won’t. Because relegating my trail buddy to the box of seldom-used tools would feel like betraying an old friend.